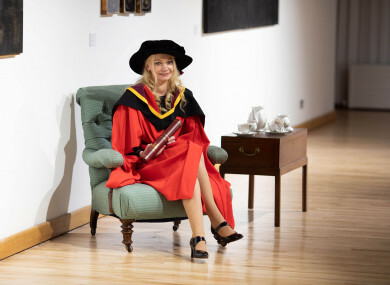 AMONG THE 1,715 University of Limerick students who celebrated their graduations yesterday was Dr Sindy Joyce, who became the first Traveller in Ireland to graduate with a PhD. Joyce, a well-known human rights activist in her own right, was one of a number of familiar faces who gowned up and received a scroll at UL, including musician and humanitarian Bob Geldof and best-selling novelist Marian Keyes, who were each awarded with Honourary Doctorates of Letters. In total, 67 students were conferred with PhD awards. Joyce is a doctoral graduate of UL’s Department of Sociology. Her PhD thesis examines how young Travellers’ movements, through access to and use of public and commercial urban space, are shaped by their ethnicity and by anti-Traveller racism. Through her analysis, Dr Joyce illuminates the boundaries that young Travellers encounter in urban spaces, and highlights how young Travellers have developed a range of tactics to negotiate boundaries and the risks associated with traversing them. Congratulating Joyce on her historic achievement, Martin Collins, Co-Director of Pavee Point, said her research “gives important visibility to the Traveller perspective, in this case the perspective of young Travellers in Galway”. Collins said it was rare for a Traveller to research and document their own community. He described Joyce as “a great role model and an inspiration” for the community. “Her hard work and determination in her studies shows that all Travellers are missing are the opportunities to succeed,” he added. Collins said the “Irish Traveller Movement is delighted to pay tribute to Sindy Joyce, PHD for her outstanding achievement”. “This PHD compliments her reputation as a committed human rights defender and passionate educationalist, whose community is to the forefront of her focus. During the course of her studies at UL, Dr Joyce was awarded a number of competitive awards, including an Irish Research Council postgraduate scholarship, and the University of Limerick FAHSS Dean’s Scholarship, and AHSS Registrar’s Scholarship Award. UL President Dr Des Fitzgerald explained that “UL’s graduate employment rate for 2017 primary degree-holders is now 17% higher than the HEA’s most recently-available national average figure which is 62% for 2016 graduates”. “80% of UL’s 2017 graduates are employed, 18% have chosen to take on further study with just 2% seeking employment,” Mr Fitzgerald added. On Friday, UL will confer Honourary Doctorates on Noel and Mike Hogan and Fergal Lawler of The Cranberries as well as awarding the band’s late singer Dolores O’Riordan with a special posthumous award. Email “University of Limerick student becomes first Traveller in Ireland to graduate with a PhD”. Feedback on “University of Limerick student becomes first Traveller in Ireland to graduate with a PhD”.